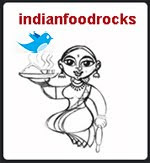 Indian Food Rocks: A White Diwali! But I do have a large smile on my face as I prep for the treats that I am planning to make. The celebrations started on Saturday with a Diwali party where we lit small personal fireworks. Medha had a blast as this was the first time she had ever had so much fun during Diwali! There's only so much that you can do with Pop-its! We performed our Lakshmi Puja at the Boulder Balvihar on Sunday, just like we do every year. The interesting thing was that it was held in a church since our regular venue would not let us use their sound system. All the children—from kindergartners to high schoolers—performed in plays with a mythological theme, loosely related to Diwali. This year we had some skits with historical backgrounds, like Jhansi ki Rani. The dialogs are hilarious, interspersed as they are with today's technology. Gods, Goddesses and demons accuse each other of not keeping up with Facebook or not having the latest smartphone. Most of the jokes are cheesy but they never fail to make it an enjoyable experience for everyone. Diwali continues to be my favorite time of the year, starting with Dhanatrayodashi. Narak Chaturdashi is usually the day that we celebrate Diwali. Since the Indian calendar is a lunisolar calendar, the five days of Diwali are not necessarily consecutive and one or more days can converge onto one day in the Gregorian calendar. This year, Narak Chaturdashi and Lakshmi Puja are on Diwali Day, which is today! It can get quite confusing but the sweet and savory treats more than make up for everything! Balipratipada is an oft ignored day even though it is of significance. The last day of Diwali was always the most fun with several generations of the family gathering under one roof. There isn't as much happening the way it used to in India but it's still a very special time of the year. It's a time for forgiveness, for introspection, for sharing and for the joy of knowing that truth will always prevail. Such beautiful photos, Manisha - and a wonderful blog post to go with them. Happy Diwali! We create our own special space with memories, longing and rituals...the photos are beautiful! Oh I just love your photographs Manisha! Hope you and your family had a wonderful Diwali! The diyas don't look makeshift at all :) and are gorgeous. And your non food posts are such important lessons one takes for granted. Beautiful diyas. Hope you have a great party! Wish you and yours a very Happy Diwali! I simply loved the 1st photo, it gave me goosebumps. Happy Diwali Manisha! And as always lovely photos. Enjoyed reading your account of a white Diwali and the lovely pictures. The diyas holding their own bravely against the snow made me smile! dear Manisha, i agree with the comments by Cybergabi ! hope your pear tree survives ! we are having wildly fluctuating weather here, as we struggle through Spring, and are affected by the ' Roaring Forties ' coming across the bottom of the Indian Ocean and the top of the Southern Ocean , hitting the West Coast of southern Tasmania. for us it brings snow,rain,beautiful sunshine and heat, sometimes all on the same day ! cheers john k.
A gorgeous white Diwali you had! We ran away to the mountains the day after Diwali...no traffic on the roads was a big plus! loved the pooja plate shot, & the diyas in the snow with the red leaves!! Oh well This was one unusual White Diwali here in NJ as well! Thanks for all the wonderful Diwali wishes! I'm so happy that the diyas in snow touched a chord! aqua, I'm not sure. We called it the haldi-kunku chi dabbee! John, we saw something like that with this storm. It was in the 80s the previous day with lots of beautiful sunshine, breezy too. Then it turned cold and rainy before the pretty white stuff came down! It sounds extreme to many but I find it rather exciting! Niv, I'm sorry it was such a rough Diwali cos of the Nor'easter that roared through but you did good despite that! Somehow this post slipped past me, since I make it a point to catch up with your photography. The comments above say all that I would have liked to say. Great pics, especially given the light, the light and the light, or the snow, the day, and the lamps. PS: For marketplace photos, I have found it useful to carry two cameras with two different range lenses.